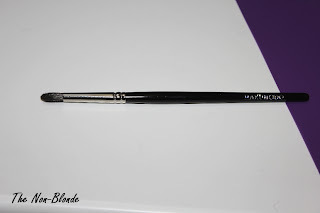 This little gem from Hakuhodo is the G5534 eye brush. It's made of wonderfully soft blue squirrel hair and the 13mm hair (about half an inch) is shaped into a nice point. 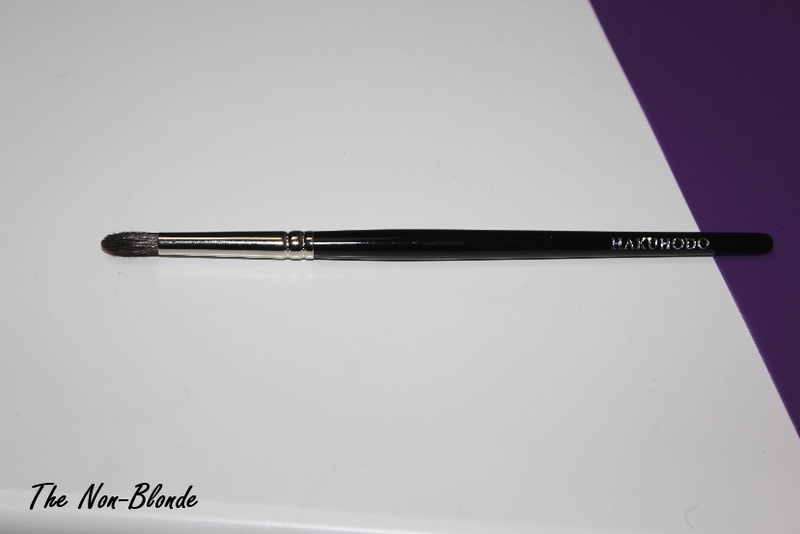 The head is very narrow, so it fits into the smallest crease or corner and glides effortlessly under the lash line. The shape of Hakuhodo G5534 appears very similar to the classic Shu Uemura 5R. The main (and important) difference is the material. Shu Uemura 5R is a pure kolinsky brush, thus not quite as ethereally silky as Hakuhodo's blue squirrel, but firmer and with a lot more snappiness. The G5534 doesn't pick as much product but is wonderful for blending and smoking a soft powder eye shadow, highlighting the tear duct or softly applying a very pigmented color along the lashes. 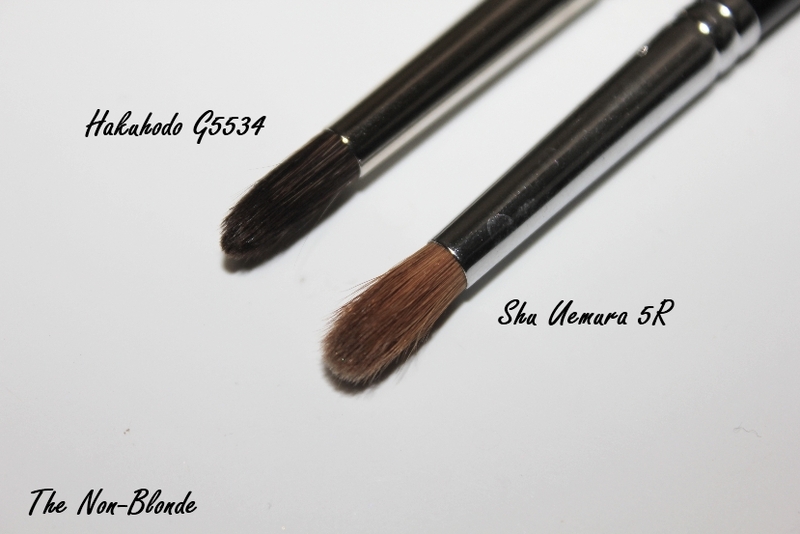 Since there is a distinct difference in the way the brushes feel and perform, I can't say that Hakuhodo G5534 is a clone of Shu Uemura 5R. I doubt it's even meant to be one (unless you have super-hyper-extremely sensitive skin and firm brushes are too abrasive for you). I keep them together in the same brush holder (a vintage mug from the coronation of Queen Elizabeth II) and use them for similar tasks, but consider the texture of the product I'm applying and how much blending or building I want to do. Bottom Line: a valuable asset. 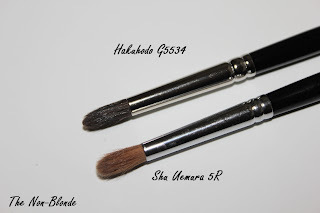 Hakuhodo G5534 Eye Shadow Brush ($21) is available from hakuhodousa.com. They ship all over the world and their customer service is beyond outstanding. 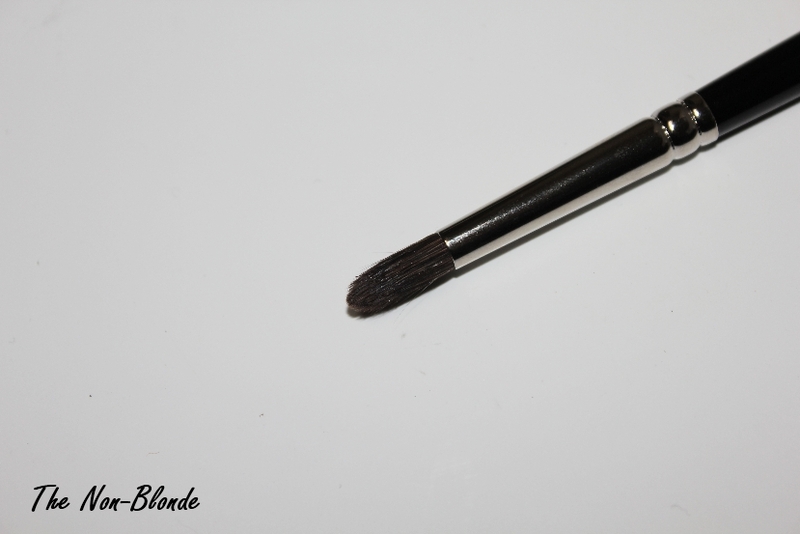 I own K005 eye liner brush from Hakuhodo and has been using it to highlight tear duct. This one is an interesting one. I'm going to Japan this weekend and need to check it out! Thanks for the post! 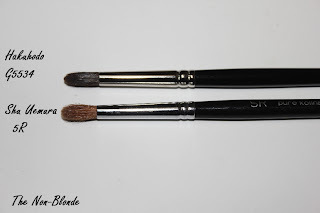 Can you please do a post on your favorite eye brushes? I consider you to be the guru on brushes and would love to know which ones you prefer. When you say pigmented colour close to the lash line, do you mean this brush would be suitable for a precise line for under eye shadow? 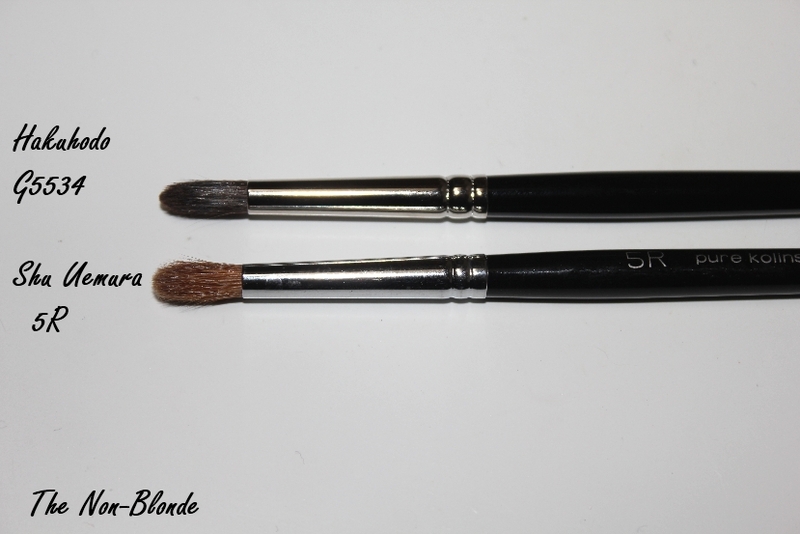 Looking for something like the Wayne Goss brush 05 new version, which doesn't ship to my country. Sorry if the answer seems obvious, I'm new to eyeshadow and really struggling to get a non racoon under eye look. Thank you! !